I am honored to be a part of Team Imperfect. It's so me. Just the other day, I shared with my students that I was thankful for a new day and the chance to fail better than I did the day before. We embrace our failures and mistakes in Room 226. Imperfect: Poems about Mistakes, collected and edited by Tabatha Yeatts, is aimed at the perfect audience: middle schoolers. We were at our most insecure about our mistakes at that age, weren't we? This is a survival handbook that will help tweens and teens navigate those tricky times. My poem, A Note From the Architect, is in the collection. 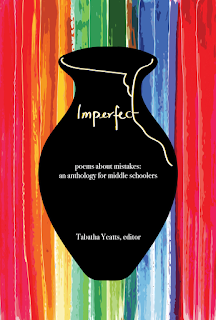 Today on the Mistakes Anthology blog, my mistake mini is being featured. Go over and check it out. Rebecca has this week's Poetry Friday Roundup at Sloth Reads. I loved that 'mistake mini', Mary Lee. Glad to be sharing pages with you in IMPERFECT, Mary Lee, and IMPERFECT blog post love today too! Thanks for your poem in the book, and for today's mini - both are fun! Mary Lee, it was wonderful reading your poem and remembering your project from a few years ago. to fail better than yesterday....I need to pin that to my bulletin board. Thank you for the feeling of being with you in this. Many congratulations on being in this anthology. Your students are lucky, Mary Lee! And so are we. I love this book! And I love your poem? Trying to remember if it was one you wrote when we did the Wonders of the World poem series? Congrats to you and all of Team Imperfect. Your mini was spot on. I love the idea of failing better each day. "the chance to fail better" than the day before"--what a powerful mindset to have as you approach each new day!! Thanks for sharing that and your carp poem as well. Mary Lee, I love that you emphasize the positive power of failure for your students. "It's better to try and fail, then to never have tried at all!" Love your "Architect" poem and your mini on the invasive "Asian Carp," thanks!